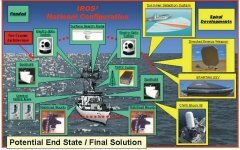 The Integrated Radar Optical Surveillance and Sighting System (IROS3) is one example by which Navigation Radar, Global Positioning System (GPS), 24-Hour Imaging Electro-Optic and Night Vision capability, Stabilized Small Arms, High Powered Search Lights, Digital Nautical Charts, and High Resolution Displays are integrated together to provide a common tactical scene for ship's forces to maintain 24-hour Situational Awareness (SA) between watch standers, patrol boats, piers, and shore based stations. 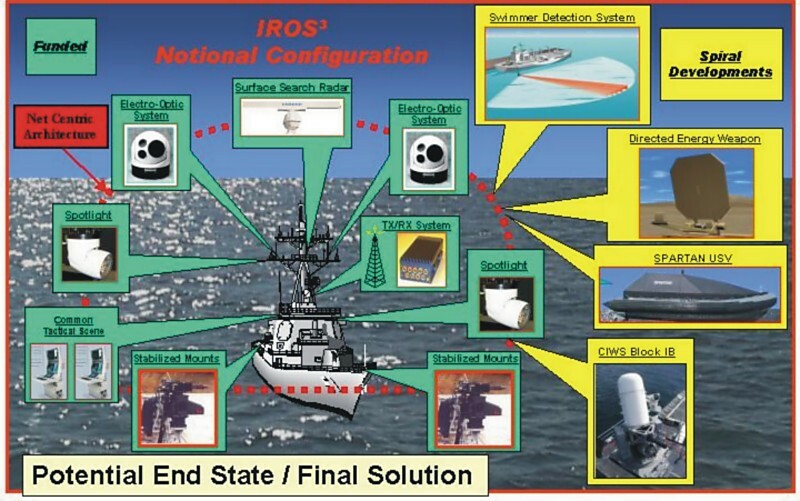 IROS³ is the overarching Anti-Terrorism / Force Protection (AT/FP) shipboard architecture that integrates sensor information and communication data while also combining automated engagement capability to protect high-value surface assets pier side at anchorage and while transiting restricted waterways. Following the terrorist attack on USS Cole (DDG 67) in October 2000, the Chief of Naval Operations created Task Force Hip Pocket, an OPNAV working group to address needs in ship's AT/FP posture and build a layered defense for ships against small boat attacks while in port and underway. Following several initial demonstrations in 2001 by NSWC Crane, IROS3 was selected by the OPNAV N7/N8 Technology Working Group as its top AT/FP shipboard initiative. A typical program of this nature would take years to develop, but by utilizing existing equipment which has matured over time and integrating it using a net-centric open architecture approach is allowing the time span from concept development to shipboard installation to occur in 11months. Key AT/FP technology enablers such as IROS³ reduce the labor burdens to meet current and expected AT/FP readiness levels by integrating stove-piped sensor data into a common workstation. The ability to share a common tactical scene between watch standers, shore stations and patrol boats is paramount to mitigating asymmetric threats. IROS³ declares the intent of a potentially hostile waterborne target and provides complete Detection-to-Engagement (DTE) sequence at a tactically significant range necessary to deter or defeat the threat. Naval Surface Warfare Center Crane Division formed a multi-talented "Fleet Tiger Team" comprised of experts from Crane, NSWC Dahlgren Division, USS Ramage (DDG 61), Tactical Training Group Atlantic, and other Fleet and industry representatives has led development of a new system to provide shipboard force protection. The team, in collaboration with Patuxent River Test Range technicians and NSWC Port Hueneme Dam Neck radar personnel performed live fire testing of the system in July 2003 at Naval Air Station Patuxent River, aboard the 100-foot "Transporter" test ship. Various small boats including a remote control jet ski were used both as stationary and moving test targets. The schedule included a combination of detect, track and engage test scenarios both pier side and underway. During the scenarios, the AN/SPS-73 navigation radar detected the target, IROS3 operators responded to automated sensor cuing to identify and track the target, labeled the target hostile or friendly, accepted semi-auto cuing of the gun mount and engaged the target. The IROS3 testing demonstrated the flexibility to meet the rigorous demands of a real world environment and provided the first opportunity for actual shipboard integration. IROS3 successfully processed multiple detect to engage scenarios both at pier side and underway on Transporter. IROS3 safety efforts were also proven to be highly successful as all detect, track and engage test scenarios were completed with no safety anomalies. The valuable lessons learned from the system's immersion into a dynamic, maritime environment were incorporated to tune IROS3's development and to mold a more suitable and user-friendly product that will meet the specific demands of the fleet. USS Ramage demonstrated the IROS3, in September 2003 for a number of Congressional and military dignitaries. NSWC Crane teamed with the ship force to perform an Integrated Radar Optical Surveillance and Sighting System, detect-to-engage sequence demonstration for Commander U.S. Second Fleet, Vice Admiral G. Roughead aboard the USS Ramage, at the Norfolk Naval Station in January 2004.